Minister of Agriculture Given Lubinda says Zambia will this year export about seven hundred thousand metric tonnes of excess Maize to the sub region. And Mr. Lubinda says he will next week announce in parliament the price at which the Food Reserve Agency will be buying maize from the farmers. Speaking on ZNBC’s Kwacha Good morning Zambia programme, the Minister said he will also be informing parliament on export modalities. Mr. Lubinda said with the current maize harvest of about 2.8 million metric tonnes and 5 hundred thousand metric tonnes in reserve, the country has in excess of about 1 point 3 million metric tonnes of the commodity. 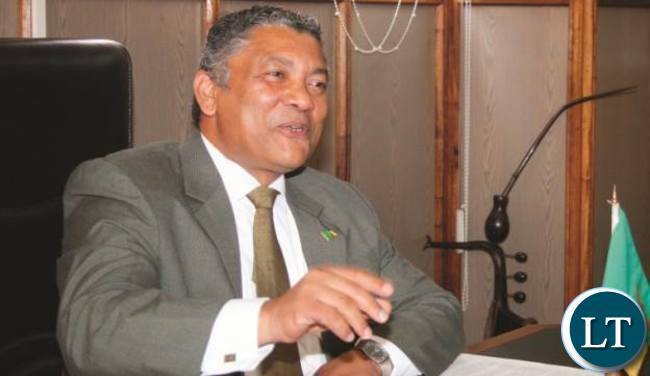 Meanwhile, Mr. Lubinda further said that the prices of mealie meal countrywide have started declining. Lubinda, after you have benefitted from this here maize. LOL – Talk about counting your chicks way too early before they hatch. This is beginning of May, and the moisture content is way above above 12%. Serious Farmers have not harvested as yet for 2015/2016. This is a very deceitful report merely intended as cover-up on the 2014/2015 maize scandal, and to deceive people who know nothing about maize growing. The new Maize price IS ONE OF THOSE THINGS WHICH WILL MAKE HH LOSE ESPECIALLY RURAL VOTES! !EXPECT PF TO INCREASE MAIZE PRICE PER 5OKG BAG FROM LAST YEAR’S K75 TO MAYBE K80 OR MORE.IF PF PAYS FARMERS WITHIN 2 WEEKS AFTER DELIVERING THEIR MAIZE TO FRA LIKE IN 2015,THEN HH SHOULD FORGET ABOUT RURAL VOTES IN PF STRONGHOLDS! !thats why i keep on reminding upnd dreamers that your hh missed A GREATER CHANCE in 2015 when Guy Scott (his supporters) MADE THINGS EASY FOR UPND! !WITH EDGAR LUNGU ON TOP OF PF AND IN STATE HOUSE,EXPECT PF TO DELIVER MANY POSITIVE THINGS TO KEEP PF LOVERS HAPPY!!! Yes just like you and your docile rural farmers who think only of today, will vote for a visionless leader.This just goes to show that in Zambia politics is about the tummy not development.Vote back pf and you will regrte a year from August. Why should we even think of changing this Govt? Rural farmers have been given tractors, roads, hospitals and schools constructed. Who can these crooks cheat? what change can Bampombo, GBM, Basinono bring? He is going for another round to make more money for himself…where is ACC? Sorry sparky below meant for chap up there! How can this Minister think of exporting maize b4 the maize is even harvested and delivered to the depots? Doesn’t FRA keep strategic maize stocks? The Minister should not think of exporting maize b4 setting aside maize stocks for domestic consumption. After the maize delivery period the Minister can take stock of the maize and only export maize which is surplus to domestic consumption. Iam one of the transpoter of the last seasons maize and still waiting to be paid my money that has in fact dwindled in value by over 50 percent. Before you talk of exporting please first settle the farmers and transporters bills. You have no shame as it was thats why you were removed from your position. Soon price of maize wil come down. The oposition tampering with price wil b halted. Farmers wil b well paid FO their maize. Kwacha elebwelafye lyonse. So Viva PF, viva!!! !